Great site, love the kitties! Keep up the great job! I enjoyed surfing your site, and I am sure everybody else will too. 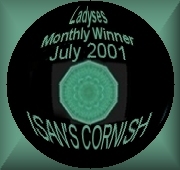 Your site has been selected as a Ladyses Monthly Award Winner for July out of all of the Silver Award Winners for the month. Congratulations!